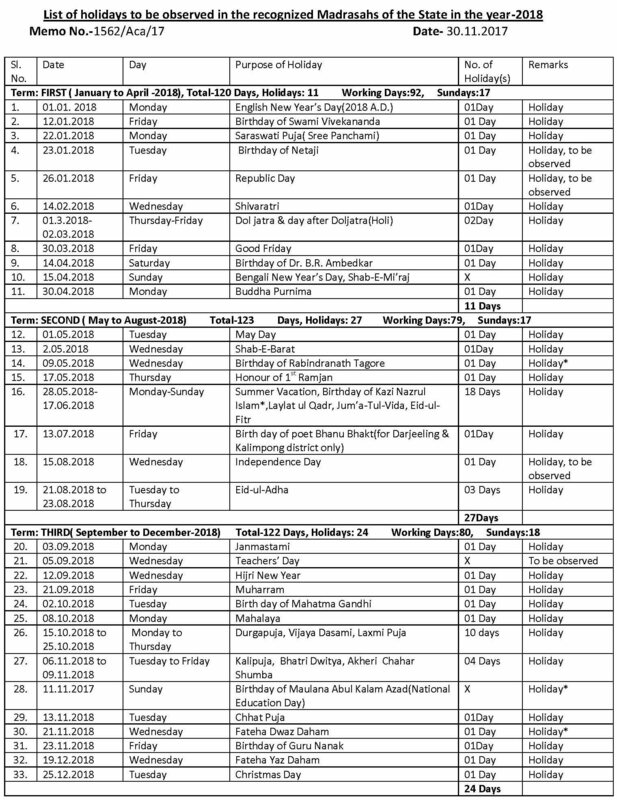 In exercise of the power conferred by clause (e) of sub-section (2) of section 20 and as per decision of the meeting of the Board held on 17.11.2017 and as directed, the heads of all recognized Madrasah are being informed that for the academic session 2018, the Madrasahs shall have to observe a uniform list of holidays as per specimen list of holidays attached herewith. The maximum numbers of holidays for this academic session will be 65 days. N.B. 1. This holiday list shall be treated as model Holiday List for the Academic Year-2018. The adjustment in Holiday(s) is permissible as per local need for festival and for any natural disaster subject to approval of the M.C./ Administrator as the case may be. The total number of Holidays in the Academic Year would be fixed at 65 days. The Madrasah authority is not allowed to exclude National and State holiday from the total number of holidays (i.e. 65 days). 7 .The Board reserves the right to change the Holiday List if required.